Expanded re-issue of CVB’s 2004 epic New Roman Times remains ambitiously thrilling. In David Foster Wallace’s meta-modern novel Infinite Jest, the United States, Canada and Mexico form a unified North American super-state known as the Organisation of North American Nations. Southeastern Canada has become a giant hazardous waste dump, and Quebecois separatists engage in acts of terror against the O.N.A.N. Camper Van Beethoven’s New Roman Times also imagines a new world, one in which the U.S. is split into thirteen distinct nations. In the sleeve notes to the new expanded edition of the album, David Lowery explains that these fictional divisions were based on the band’s touring experiences. For example, Texas was identified as a powerful “nation” with access to the Atlantic, Pacific and Arctic oceans, with control of the oil and gas resources of North America. But then, in this imaginative alternate version of a sci-fi rock opera, things get weird: parts of Southern California attempt to secede from the Republic of California, and civil war ensues. The Christian Republic of Texas opportunistically intervenes in the Civil War, re-told from the perspective of a young Texan soldier. Lowery was born in Texas but raised in California, and although his sympathy was instinctively more Californian, he decided to tell the story through the eyes of “the other”. The backdrop allows a chance for the songs to be rooted in struggle, of reds versus blues, or as an (unintentional) commentary on the Iraq war. 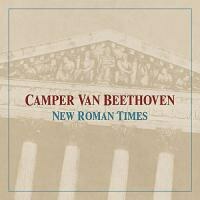 New Roman Times was billed as Camper Van Beethoven’s first studio album of new material since 1989’s Key Lime Pie. This is strictly correct, although fans may interject to qualify this. In 2000, a rarities compilation album was released, followed in 2002 by some supposedly newly found tapes of the band performing Fleetwood Mac’s Tusk in its entirety. New Roman Times, however, seemed to signal a more permanent return with a re-formed version of the band, and contributions from members of Lowery’s other band, Cracker (namely Johnny Hickman, Frank Funaro and Kenny Margolis). A family affair indeed, and it’s noteworthy that in the two-year gap between the releases of Tusk and New Roman Times, Cracker put out four records -- a studio album of new material, a live album, a bluegrass ska album and a covers album. With both bands’ careers continuing to thunder ahead with frenetic pace, it could be suggested that it’s a little premature to be re-issuing an album only 11 years after its original release. We should consider, in accordance with the band’s own punk rock spirit, whether they themselves have entered the long plastic hallway they sing about on this album, a place where rock stars do the wrong thing for money and vanity, and whether such a relatively quick re-release is in fact a sell-out. With expanded sleeve notes and four extra tracks almost all impossible to find elsewhere, the answer must be a resounding no. Also of note: the first version of the CD is now expensive to buy, and a new release provides the opportunity for fans to obtain the album on vinyl, which was previously impossible in 2004. As an artistic statement, concept albums can succeed or fail on the basis of the larger idea (think Spinal Tap), but fortunately here, although there is an ongoing plot, it’s possible to enjoy the album song-by-song. “51-7”, where we meet the protagonist young Texan as he joins an elite military unit, is surely a sing-a-long alt-anthem. And there are plenty of others: “Might Makes Right” is another anthemic stand-out, and a distinctly unusual kind of protest song, as the Texan begins to question his Christian beliefs whilst he is on patrol in the Middle East. “That Gum You Like Is Back In Style”, despite the laid-back but backwards-sounding instrumentation, is remarkably catchy, with the title taken from David Lynch’s cult TV show Twin Peaks. The title is an appropriate allusion because according to Lowery, this song is a “crypto-key”, describing the development of an un-breakable quantum encoding system by the Northern California government and “CVB” (an underground insurgent group, whose name is rumoured to be a reference to a popular band from a parallel alternate reality). The themes and ideas in New Roman Times rightfully extend Camper Van Beethoven’s reign as kings of the underground. As part of the plot, a strain of new genetically altered cannabis, flower, is in circulation, possibly explaining California’s sudden technological advances. Instrumental “The Poppies of Balmorhea” mixes Pink Floyd and Eastern European élan to create a druggy cinematographic drama. The lysergic “I Am Talking To This Flower” trips into “Come Out”, showing off the band’s experimental side -- in this alternate universe, a pop star plays repetitively hypnotic blues rock, particularly appealing to flower smokers. Those who know Camper Van Beethoven’s music will already be aware that their albums are often interspersed with strings-orientated instrumentals thanks to Jonathan Segel’s violin, sitar and mandolin work. New Roman Times is no exception to this, and there are some fine non-vocal tracks: “R ‘n’ R Uzbekistan” is a foot-stomping joy and “Discotheque CVB” slowly builds into a funky work-out worthy of Daft Punk. So what about the extra tracks? There are two remixed versions of earlier songs -- “Los Tigres Dub” and “Might Makes Right Dub”. These versions push the limits of each song out on to an extended limb, and are certainly stimulating. “Alien Ghost Song” is a slow, warped-out blues song with a certain amount of dark humour, re-counting how extra-terrestrials bite off a doctor’s hands and remove his adrenal gland. “It’s Gonna Rain” is a moody rocker with descending chords surely destined for a David Lynch or Quentin Tarantino film soundtrack. The interesting and entertaining alternative reality of New Roman Times is much like the universe of music itself. The listener can enter into it as superficially or deeply as desired. This is a record which takes on war, drugs, aliens, rock and roll and ultimately the nature of the band itself. Without a sense of humour, this project would have turned out as an epic fail. Grandly ambitious, it’s a wonder that the whole concept did not sink the album, and that the band did not implode or explode in a cloud of glittering flower smoke. But as yet, Camper Van Beethoven is not dead. Long live Camper Van Beethoven, and don't forget those hippy chix.